Chinese piano prodigy Yundi Li’s recent Seoul performance has been making headlines -- not for an outstanding performance, but because of his tempo blunders and seemingly shameless attitude afterward. 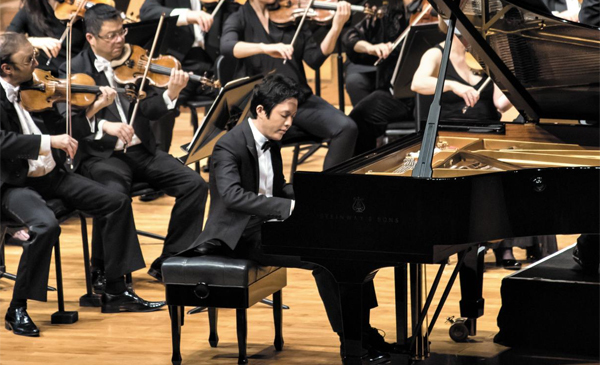 The 33-year-old pianist returned to Korea to play alongside the renowned Sydney Orchestra, which performed two shows on Oct. 30 and 31 at the Seoul Arts Center -- with Li performing as a soloist with the orchestra Friday and violinist Vadim Repin performing Saturday. Despite being referred to as a “Chopin specialist,” Li made many uncharacteristic mistakes in his performance of Chopin’s Piano Concerto No. 1, which forced the orchestra to stop playing for about 10 seconds so that everyone could recompose and restart. Li won the international spotlight after winning the first prize at the International Chopin Piano Competition in 2000 at age 18, becoming the youngest and first Chinese winner in the history of the prestigious competition. He has since been widely regarded as a leading exponent of Chopin’s music. “A mistake of this scale is not something a professional of his global reputation should be making,” the SENA representative added. Ticket prices for Friday night’s concert were listed upward of 250,000 won ($220). It was not only Yi’s mistakes that the audience couldn’t seem to shake, but rather his attitude toward conductor David Robertson during the orchestra’s sudden pause, in which the pianist appeared to shift the blame for his tempo mistakes onto the maestro. Li left the stage without an encore performance and canceled the scheduled autograph session. The pianist further alienated many of his local fans when he uploaded his selfies in a Halloween costume a few hours after the concert concluded -- seemingly unfazed about the events of the night. “Never come back with that arrogant attitude after (your) performance!! !” someone wrote on Li’s Facebook page. “Thanks for your sh---y performance! It will be my everlasting memory to mock you forever,” said another Facebook post. Lin eventually posted an apology to friends and fans on his Weibo account on Sunday for his mistakes during the performance, and thanked the orchestra and conductor for their tolerance and support.